There are a variety of types of fat that you consume in your food, including unsaturated fats, saturated fats, and trans fats. Unsaturated fats are also known as your “good fats” because they can have a positive effect on your overall health. Unsaturated fats are usually present in vegetarian foods, while saturated fats are usually present in meat, and trans fats are more common in packaged foods. In studies, it has been shown that consuming unsaturated fats instead of trans fats and saturated fats lowers the risk of vascular disease, heart disease, and stroke. The mechanisms by which unsaturated fats affect lipids is not fully known, but studies have shown that they can modestly lower your LDL cholesterol and increase your HDL cholesterol levels. Some polyunsaturated fats (PUFAs), such as omega-3 fatty acids, can also help lower your triglyceride levels. Although there are many supplements containing unsaturated fats, such as cod liver oil and fish oil, getting unsaturated fats from the foods you eat can also supply you with other heart-healthy nutrients in your diet in addition to the unsaturated fats. Current dietary guidelines recommend that 25 to 35% of your daily caloric intake should come from fat, ideally from mostly unsaturated fats. If you want to include unsaturated fats in your diet, you should make sure that you replace other foods in your diet that are high in saturated fat – rather than add to them. Otherwise, you may risk gaining weight and increasing your overall lipid levels. Avocados: This delicious fruit, which has become very popular in recent years, is chock-full of monounsaturated fats. Avocados can be added to many recipes without too much prep time– as a spread on your sandwich or sliced onto your favorite soup, salad, or entrée. 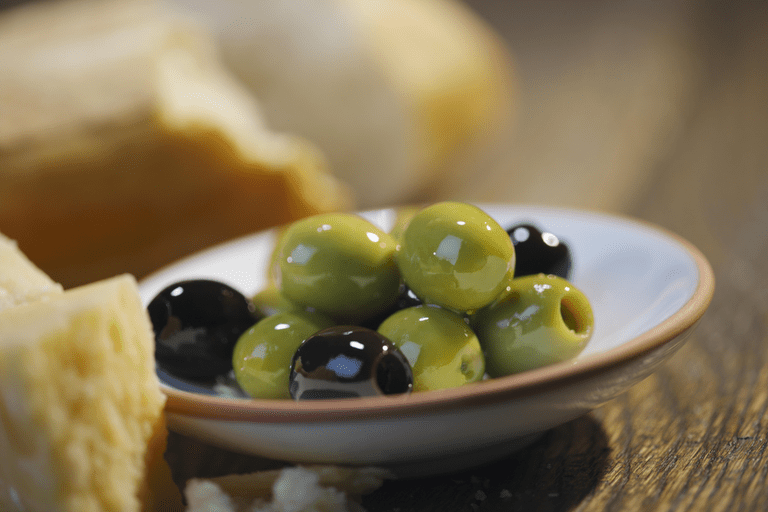 Olives: Green, black, Kalamata – olives are not only high in flavor, but they are also high in monounsaturated fats. Whether you slice, dice, or use them whole, there are many opportunities to add olives to your cholesterol-friendly diet. Nuts: These delicious foods come in a wide variety of types and most people like at least a few varieties. Nuts are high in both PUFAs and monounsaturated fats. Walnuts are typically higher in PUFAs in comparison to other nuts, whereas pistachios, almonds, and pecans are higher in monounsaturated fat content. Nuts are also high in other healthy ingredients, such as fiber, phytosterols, vitamins, minerals, and protein. Nuts are versatile and can be included in your diet in a number of ways. A handful of nuts can make a satisfying snack, or they can be added to a salad. Fatty fish: Fish are generally lean and good to include in your lipid-lowering diet. Some fish are high in omega-3 fats, a type of PUFA. Fish in this category would include salmon, mackerel, herring, tuna, and anchovy. If you include this type of fish in your diet, you can keep it heart-healthy by grilling, baking, or poaching. However, you should avoid frying the fish, as this can introduce calories and unhealthy trans fats into your diet. Certain oils: Oils can be added to dips and dressings and they can also be used in cooking your favorite sautéed or baked goods. If you’re following a lipid-lowering diet, you can switch out butter or margarine for oils high in unsaturated fat. These oils include olive, canola, vegetable, safflower, corn and soybean oils. Seeds: Besides nuts, seeds can also make a good go-to snack that is high in filling fiber, protein, and unsaturated fat. Sesame seeds are higher in monounsaturated fats, whereas pumpkin, sunflower, flax and chia seeds are higher in polyunsaturated fats. Seeds can be included in your sides, in your cereal, or as a topper for yogurt or salads. However, you should watch out for salt content – since some seeds may be prepared with a lot of salt. Eggs: Eggs contain saturated fats and unsaturated fats. When they are prepared without frying, they are considered a healthy addition to your diet. Dark chocolate: Chocolate contains a small portion of monounsaturated fats, and, in low to moderate amounts, has been considered healthy. However, eating a lot of heavily sweetened chocolate can be high in calories and in unhealthy fats. There are also commercially prepared foods available that may also contain monounsaturated and polyunsaturated fats. To check if your favorite food is high in unsaturated fat, you should check your food labels. Schwingshackl L, Bogensberger B, Benčič A, Knüppel S, Boeing H4, Hoffmann G3. Effects of oils and solid fats on blood lipids: a systematic review and network meta-analysis. J Lipid Res. 2018 Sep;59(9):1771-1782. doi: 10.1194/jlr.P085522. Epub 2018 Jul 13. Which Common Foods High in Saturated Fat Should You Limit? Can Tai Chi Lower Cholesterol Levels?